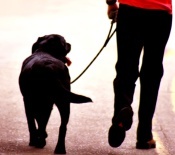 Walking a dog to heel is advanced training that results in a dog everyone wants to walk, greet and admire. Having control over your pooch while you are out and about makes your experience enjoyable, un-stressful and what you want it to be. It takes patience, practice and constant coaching for your pet to comprehend and obey this obedience command, so take your time and stay positive. Here we go!